GALION — Growing up in Galion, Steven J. Gifford’s favorite subject in school was not English, yet he has written three books and is working on his fourth. “I want people to know that it’s okay. If you don’t do that great in English, you can still write a book. Everybody has a story to tell,” Gifford said. Gifford created Mike Company Media to assist people in all aspects of publishing a book, including writing, editing, book cover creation, publication and promotion. “We provide everything you need to get your book completed and out there to the readers,” Gifford said. Gifford, who served a decade in the US Marines, derived the name for his company from the battalion he was part of during boot camp. 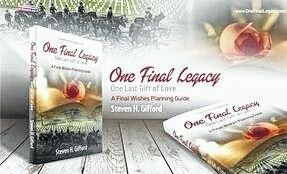 Gifford, who penned the books, “One Final Legacy,” and “Final Expense Boot Camp,” is also committed to helping people plan ahead so their final wishes will be carried out after their death. “Final Expense is designed to help people with their final wishes planning and includes forms people will need and instructions on how to create things like videos and emails for your loved ones after your death,” he said. Gifford also helps operate the website http://eplot.us to also help people with final planning and expenses along with the website, http://eclick.insure to help people with insurance needs. Gifford works with his brother, Scott, in Galion at One Fidelity Group. Gifford’s third book, “Son of a Preacher Man,” is designed to inspire people as Gifford tells his story about the toughest battles of his life that were fought off the battlefield. “It is about successes and failures and how to pick yourself up and keeping going when you get knocked down,” Gifford said. Gifford said he is currently writing his fourth book, “2 Seconds,” from his home in Marion. “I am going to contact Galion City Schools to see if I can give each of the seniors this year a copy of “Final Expense Boot Camp,” which can help prepare them for a future in helping others plan to carry out their final wishes,” Gifford said. For more information about Mike Company Media, visit http://www.mikecompanymedia.com.